We have also as usual first the Windows binaries ready. The Mac version will most probably follow this weekend. We have unfortunately still no good news for Linux. No maintainer anymore. But you can always build it by yourself. The source code is at Github. And the advice how to compile Blender works for Bforartists in the same way. The changes between RC1 and the full version aren’t really worth mentioning it. We just catched two last minute things. I have still to point at Cuda in the 32 bit Windows version. GPU rendering may or may not work for you. Cuda 9 doesn’t support the outdated 32 bit architecture anymore. I have compiled the 32 Bit version with Cuda 8 now. But it throws still an error with my Nvidia 1060. So expect GPU rendering not to work in the 32 Bit version. Please upgrade to a 64 Bit Windows in this case. It is more than time! 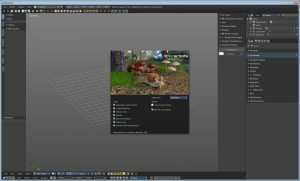 Bforartists is a complete 3D suite to create 3D content. It offers you the full 3D art pipeline to create game graphics, prerendered movies and stills. From modeling, sculpting, texturing, rigging, animation, rendering, up to post processing. Have a look at the features page to find out more. Bforartists stands for Be For Artists. A reminder to develop for the user, not the programmer. Bforartists is a fork of the popluar open source 3d software Blender. With the goal to improve the UI and usability. 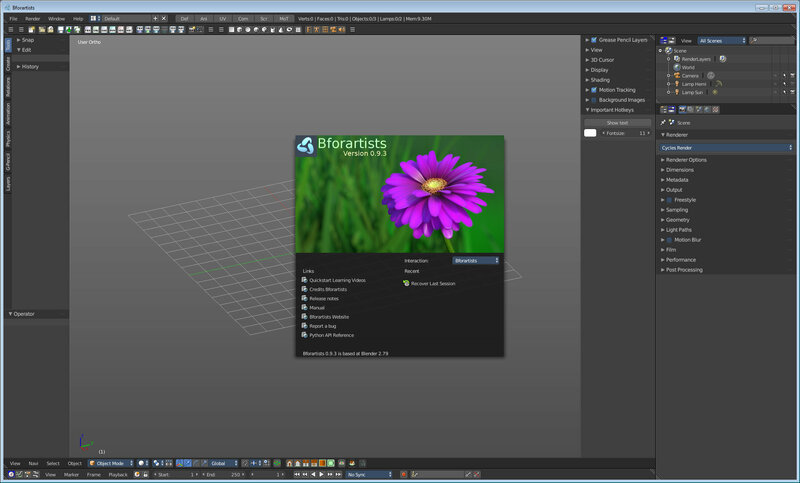 Bforartists 1.0.0 is based at Blender version 2.79b. This entry was posted in Allgemein on Fri-11-05-18 by Reiner. We have a new version of the Blender fork Bforartists ready. This version of the 3D software is a release candidate for the upcoming version 1.0.0. It marks the end of the initial development cycle. Nearly three years of work comes to an end. And most of the initial goals are fulfilled. There aren’t this much changes in this release. Just around 40, and most of them small ones. The Bforartists 1.0.0 RC1 release is mainly cleanup work and last fixes to prepare the final version. We have catched a few bugs, extended the material library vx by more materials, added some last icons, and did some last changes. There were for example still two “are you really want to delete” dialogs around. A note to Cuda in the 32 bit Windows version. GPU rendering may or may not work for you. Cuda 9 doesn’t support the outdated 32 bit architecture anymore. I have compiled the 32 Bit version with Cuda 8 now. But it throws still an error with my Nvidia 1060. So expect GPU rendering not to work in the 32 Bit version. Please upgrade to a 64 Bit Windows in this case. It is more than time! The further road map is to wait until the Blender 2.8 development at the UI is finished. Makes no sense to change something that is under a permanent change anyways. A first incarnation of Blender 2.8 should arrive at the next Siggraph. And then we can have a look at it, and will continue the development. But we don’t run out of work. We need a new homepage since Drupal 7 is now EOL. And at the documentation front there is years of work waiting. As usual, a big thanks to the team! This entry was posted in Allgemein on Sat-05-05-18 by Reiner. It took a while. But now Bforartists 0.9.6 is here. The Windows versions are already up and running. You can find it in the downloads section. Mac and Linux versions will hopelfully follow soon. 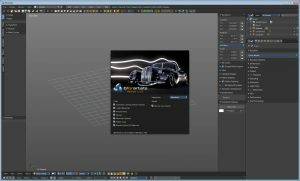 The Bforartists 0.9.6 release brings the changes from Blender 2.79a. Which are around 200 fixed bugs. Bforartists adds around 260 resolved tasks on top of it. The biggest change is that it brings around 450 new Icons. Now nearly every menu item has icons. It brings also updates to the addons. We have removed quite a few double menu entries again. And quite a few properties have moved from the header menus into tool shelf and properties sidebars. We have again some changes at the keymap. We mapped Y, X , C for mesh select mode to X, C, V instead because of the american layout issue where Z and Y are flipped compared to the european keyboard layout. Lasso select works with LMB now everywhere. The hotkey to view selected is assigned to D now. This one was formerly Numpad 0, and is now much better to handle. The caveat is that we ran into another hotkey conflict that way, which we still have to fix. Holding D is also grease pencil draw. Another big redesign ist the whole nodes toolshelf. It comes now with icon buttons. We have reduced the tabs from 13 in Blender to three tabs in Bforartists. And the categories have become panels. This is now much better organized, and you can easier find what you are looking for. And finally we have fixed a few bugs. Another change is that we switched to Inno Setup to build the installer. We loose the ability to connect the *.blend file association with Bforartists while the update process. But we win with a much simpler update process. At this point as usual a big thanks to the whole Bforartists crew, which made this release possible. Many thanks folks. This entry was posted in Allgemein on Sun-04-03-18 by Reiner. I have now finished the work at the page. I may return to recolor the menu a bit better. But the page is fully functional again. This entry was posted in Allgemein on Thu-11-01-18 by Reiner. Once again we have fun with the WordPress installation. Images have lost their size, users reports about shot down layouts, and the FLV videos have quit working. I have no idea how long this one is around. The page displayed fine at my main pc. I have temporarily switched to another theme now. And hope this will fix the issue with the shot down layout for some users. It has already fixed the issue with the images. I will fix the FLV issue as fast as possible. And i will have a look for a better fitting theme. Sorry for the inconvenience. This entry was posted in Allgemein on Wed-10-01-18 by Reiner. Merging the 2.79 features into Bforartists didn’t work as flawless as expected. We had fixed a showstopper regression with 0.9.4 already. Now we stumbled across even more. Which made a quick version 0.9.5 necessary. Some important Cycles settings were missing. We hope that this was it in terms of merge regressions. Sorry for the inconvenience. This entry was posted in Allgemein on Sun-08-10-17 by Reiner. We had a showstopper bug. The bake panels were gone. And so we quickly made this emergency relase 0.9.4. Windows installer and zipfiles are up and running. Mac and Linux versions still needs a bit more time. This entry was posted in Allgemein on Fri-15-09-17 by Reiner. Bforartists 0.9.3 is released. The windows binarires can now be found in the download section. I cannot say though when the Linux and Mac versions will follow. 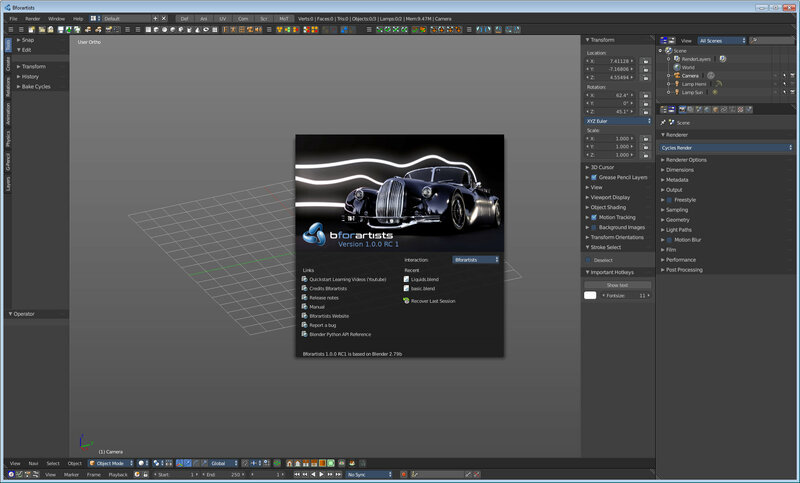 The new version brings all the goodies from Blender 2.79. Like Denoiser, PBR Shader, Shadow Catcher, Flimic Color Management, etc. . 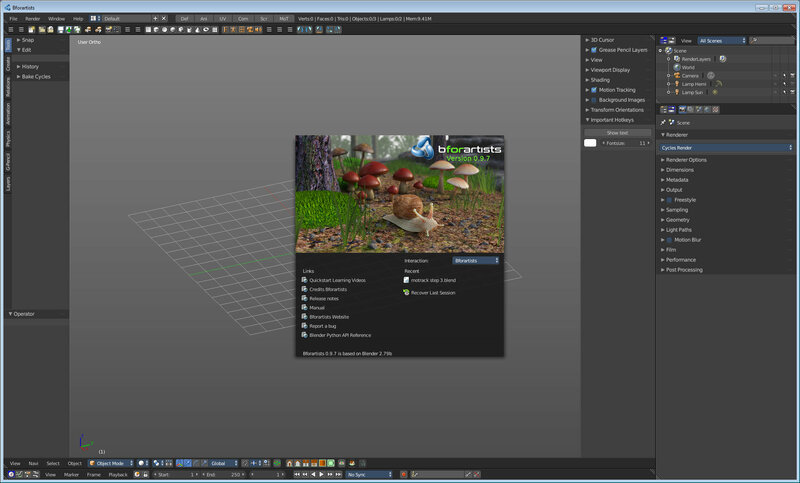 Please have a look at the Blender 2.79 release note at the Blender page for the new features. Important is the compatibility note. Blender 2.79 is not fully backwards compatible to earlier version anymore. And this affects of course Bforartists 0.9.3 too. The changes in Bforartists itself sums up to over 100 changes again, but are each rather small. The last weeks and months were in big parts spent at documentation and tutorials. Unbelievable how time consuming this chapter is. That’s why Bforartists 0.9.3 brings mainly fixes and some small changes and cleanup operations. And we had some inconsistencies in the hotkeys again. F2 to call the console is removed since it conflicts with Linux build. The Properties sidebars now all opens with Ctrl T, not longer with N. And we have readded the hotkey to Loopcut and Slide, since it is a fundamental modeling tool, and often used. The updated manual chapters will shortly follow. This entry was posted in Allgemein on Wed-13-09-17 by Reiner. The nodes icons panel provides you with icon buttons for the tool shelf in the Node editor. The first version was incomplete, it covered just the materials. This version covers now all tabs and cases in the Node editor for Blender 2.78c. And it is a bit different organized. This entry was posted in Allgemein on Mon-21-08-17 by Reiner.